This may turn out to be the best autobiography, or memoir, that I will read this year. I picked the book by the cover, something I have been reproached for many times, but still haven't learned not to do. The image of the young man on the cover, with a picture of whom I believed to be his wife, or girlfriend, in the background, reminded me of my parents generation, so I was immediately interested in reading the book. I had no idea who Dale Bumpers is. I do now! I read a lot of books, being retired early has given me the time that I always wanted to just sit and read. There is so much to be learned in everything that is written. And when you come across something as well written as this book is, you just keep on turning the pages. Like most good books, this one can be read on several levels. As a memoir, it is extraordinary in the author's accomplishments, both as a busisnessman and lawyer; and later on, as a politician. His rise from the relatively humble beginnings of small town Charleston, Arkansas during the Depression years, to Attorney, then Governor, and later United States Senator, make for a wonderful story about the promise inherent with being born an American. His exploits with his brother and the bond with his family are the stuff that William Saroyan wrote about in "The Human Comedy." This is a story about America when she was still perceived as strong and good. The grief of the author concerning his parents death in 1949 is palpable to the reader. His sister's struggle with health issues that almost killed her highlight the compassionate leanings of the future Senator fron Arkansas. He came from the people he represented, never forgetting the deprivations of his own youth. On another level the book is a history of the times in which it takes place. There were times of great social upheaval during the years leading up to, and even after, the Second World War. These were times in which our system of government was sorely tested. 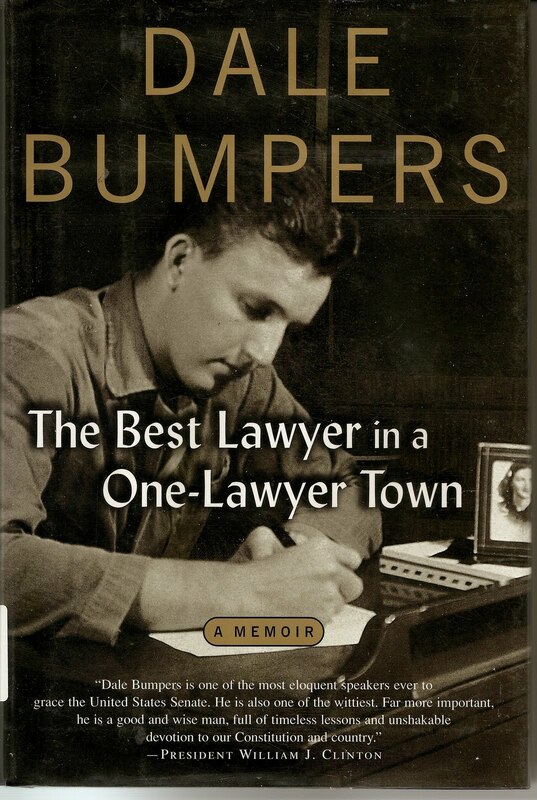 And Dale Bumpers had a front line seat to all of it, working first as a paper boy, then in his father's hardware store, and also as a Marine during the closing days of the war. Through all of these adventures, somehow Mr. Bumpers never loses his humility, something which he inherited from his father, an educated and compassionate man, to say the least. Upon his return to Arkansas after the war the author goes to school in Chicago on the GI Bill, becomes a lawyer and returns to Charleston to run his fathers hardware store. He also begins his law practice in the rear of the store, conjuring up shades of Abe Lincoln in Springfield. There is one story in this book that truly gives the measure of Mr. Bumpers and his extraordinary life. That is the episode of the alarm clock. There was a man in Charleston named Keith Robinson. He was borderline in his mental capacity and his job was to sweep the streets. He was an object of ridicule to many of the town's school age children. Mr. Bumpers was not one of these tormentors. But several years later he sold Mr. Robinson an alarm clock on credit, knowing pretty well that he would never be able to collect for it. Mr. Bumpers then recounts that although he was appalled at the treatment of Mr. Robinson by others, he never once did anything about it. His recollection of the shame he felt, and still feels, concerning the one time he did ask Mr. Robinson when he was going to pay for the alarm clock, which only caused Mr. Robinson extreme embarrasment, is very telling. That the author includes this story, highlighting his own shortcoming in the tale, serves to show him in an honest light. Something this poignant and introspective has not been expressed since Benjamin Franklin wrote of his own failures of morality in his celebrated Autobiography over two hundred years ago. The book is very well written and chronicles Arkansas political history in a way that lends new understanding to the politics of our time. Along the way the author regales the reader with story after story from his days as an attorney. The Civil Rights years and the Central High School intergration episode in Little Rock are extremely interesting chapters that shed further light on the town of Charleston and the way in which this volatile issue was handled there. His political leanings were on hold during the years that he was struggling with the hardware store and juggling his work as an attorney. Eventually, in 1962, he ran for state office and lost. Licking his wounds he went on to try again, and by 1970 he ran against, and defeated, Governor Winthrop Rockefeller in his bid for a second term. The book kicks into high gear when the Governor goes on to the United States Senate where he served for 24 years. Upon retiring from Government service he becme an attorney, associated with the Washington law firm Arent Fox. In January of 1999 he delivered the closing address in the Impeachment Hearings of President Clinton, which resulted in the charges being dismissed. This is an insightful and highly readable book. It tells the story of America, and one man, during decades of struggle and change for America. That struggle continues today.